First of all, I would like to sincerely apologize for my inactivity in the last few weeks. It wasn’t that I had forgotten you but more like me adjusting to the masters programme, new social situations and trying to get “all my ducklings in a row”. The positive aspect of this absence was that I managed to acquire a lot of new and relevant knowledge. So actually, if you think about, our break was a good one because now I can help you better. One of the very interesting topics we facilitated in class was relativity. This is what I would like to cover in today’s article. See sources at the bottom if you want to read more about it, although I must admit the articles seem to have been written by people who really really like their thesauruses. Relativity – the tendency to estimate the value of things according to how they compare with other items. Our traditional idea of how we approach choices was a rational weighing of the values each option and choosing the other that would benefit us most; value maximization. The problem with this notion is that we are not completely rational. Great examples of our irrational behaviour are the attraction effect and the compromise effect. 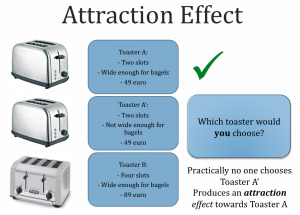 The attraction effect is when you have two viable options and add an additional one that is similar but slightly worse than one of the options. As it is human nature to compare, we compare the items that hold similarities to one another. See the example below. If we are given the option of three toasters where two are similar and one is very different, people end up comparing the similar two. As you see, toaster A’ is the decoy in order to make customers choose toaster A. This is commonly done in house hunting as well. You will often see two houses according to the house hunter’s preferences and a relatively wild card. If one is perfect and the other is slightly more expensive, the house hunter will tend to choose the perfect house the real estate agent intended for them. 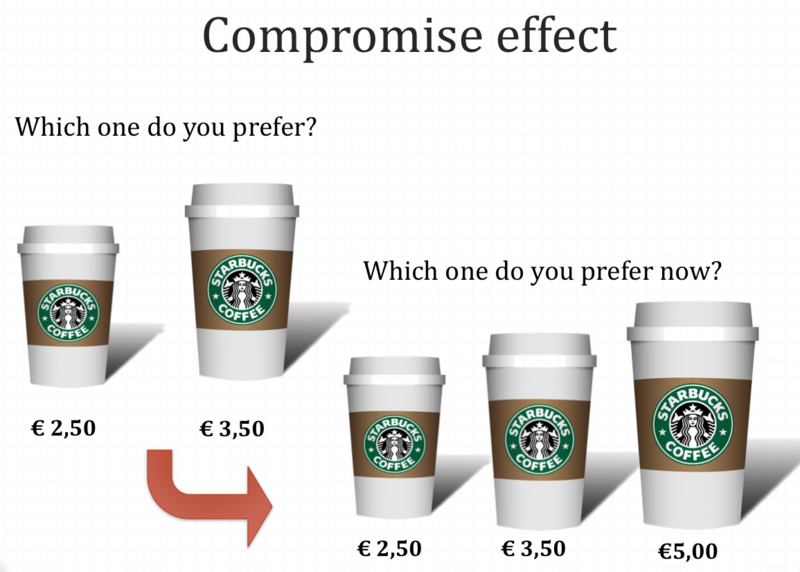 The compromise effect is definitely used often within the business world. The effect is adding a larger option so that you will choose the initial large option. Companies who make bread makers have made a ridiculously expensive model for you to buy the expensive model and the same applies to printers, fast food chains- they are all acting on this effect. As the picture above indicates, the addition of a larger option makes the €3,50 more attractive. The experiment indicated that without time pressure, people are more inclined to choose the middle option(s) because they were able to weigh each against one another. With time pressure, the compromising option is less attractive and the participants chose either the small option or the large option, as they were not able to weigh and assess the options. We are, therefore we compare. It is human to look in our direct environment to compare ourselves to the readily available comparisons. 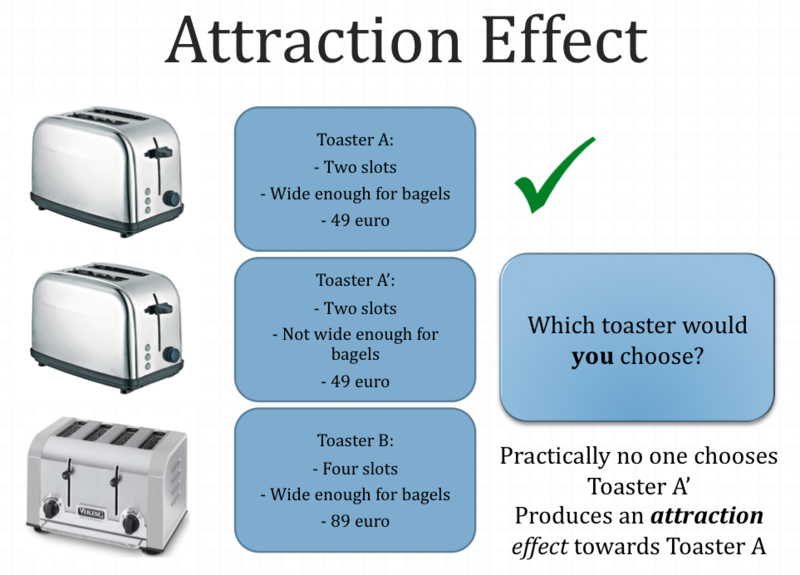 As you’ve seen the attraction effect and the compromise effect influence our decision making process as we feel the need to compare. And this is a very good question. Why should you care? Why does it matter that you compare your coffee and toaster to other sizes and toasters? But this is the thing. It isn’t just coffee and toasters. This is how manipulation works. – Comparing oneself to others. As a human being, it is natural to compare who you are, what you do and how you think to others in your direct surrounding. – Comparing what you have to others. As Chuck Palahniuk put it: “Are these things really better than the things I already have? Or am I just trained to be dissatisfied with what I have now?” Luxurious items gain more value when they are better than the items of others. – Your happiness. If you are constantly comparing yourself to the people who are doing better than you in life, it is bound to have an effect on your self-esteem and self-valuation. For some people it may inspire a boost in motivation and productivity, yet there are others who become unhappy and very negative about their own lives. – Businesses manipulate you. They do it constantly and they will not apologize. The bottom line of profit-focused businesses is to make profit. Whether you benefit from it or not, well, I will leave that up to you. There is good news; we can break the cycle of relativity! Being aware of your behaviour improves your ability to realize your actions and the next step is to find a way to avoid falling into the habit of comparing constantly. The first way to avoid relativity is by removing yourself from situations where you feel envy or jealousy. When you feel someone in your direct environment is causing you to feel this way, try to see a more complete picture. If you compare yourself to your more fortunate friends then compare yourself to your other friends as well. The second way to avoid relativity is to change your perception from narrow to broad, basically complementing the first way. Instead of comparing yourself only to those in your direct environment, try to remember to look broader. Be aware of the factors which influence you. It is interesting to break the cycle because it can lead to a happier you. – Ariely (2008): Chapter 1: The Truth about Relativity.- Simonson (1989), “Choice Based on Reasons: The case of Attraction and Compromise Effects,” Journal of Consumer Research, 16 (September), 158-174.- Dhar, Nowlis, and Sherman (2000), “Trying Hard or Hardly Trying: An Analysis of Context Effects in Choice,” Journal of Consumer Psychology, 9 (4), 189-200.